Here come old flat top. He come grooving up slowly. He got joo joo eyeball. He got hair down to his knee. Got to be a joker he just do what you please. He wear no shoe shine. He got toe jam football. He say I know you, you know me. Come together right now over me. He got feet down below his knee. Hold you in his armchair you can feel his disease. He say. "One and one and one is three." Got to be good looking 'cause he so hard to see. 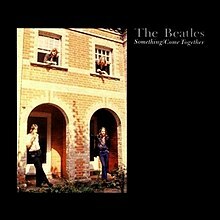 (1969) "Something" / "Come Together"
"Come Together" is a song by the Beatles written by John Lennon and credited to Lennon–McCartney. The song is the opening track on the album Abbey Road, and was released as a double A-sided single with "Something", their 21st single in the United Kingdom and 26th in the United States. The song reached the top of the charts in the US, and peaked at number four in the UK.